Hello! 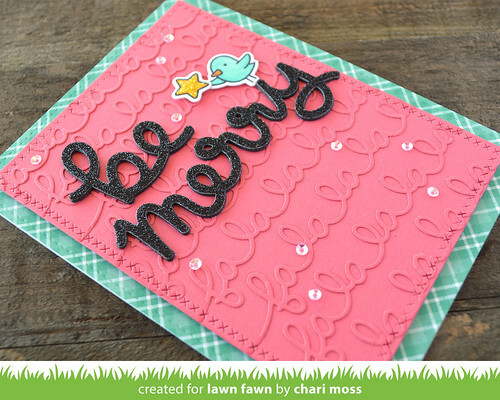 Today as Lawn Fawn Inspiration Week continues we are playing with some of the new scripty word and border dies. My card today uses the new Scripty Be and Merry word dies along with the Falalalala border die. I used the Falalalala border die to cut some Guava cardstock then I layered all the die cuts onto a Guava cardstock panel to create a cool tone on tone background. I got this idea from a card I recently received from the always amazing Jennifer McGuire. 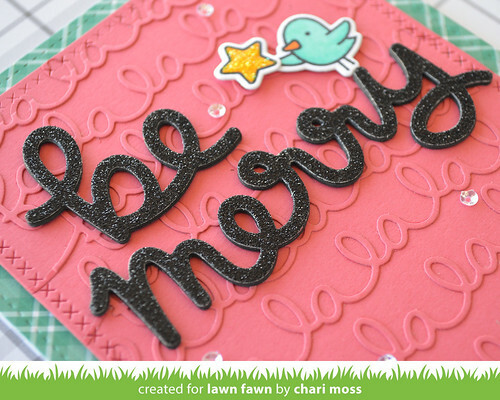 Sometimes I have trouble figuring out how to incorporate these delicate border dies but this might be my new favorite idea and I will be trying it again! After layering the die cuts I used one of the Cross Stitched Rectangle dies to trim up the panel and add that cool stitching detail. I also used the largest Stitched Rectangle die to cut a piece of Prancer Perfectly Plaid Christmas paper for the card base. I raised the Guava cardstock panel up with foam adhesive on top of the plaid paper. For the sentiment I die cut the Scripty Be and Scripty Merry from black cardstock three times and stacked them and then added die cut black glitter cardstock as the very top layer. You could achieve this effect with stickles or wink of stella as well. To finish off I added the cute little bird holding a star from Cheery Christmas with some yellow stickles on the star and some tiny clear Pretty Pink Posh sequins scattered about. Be sure to check out the Lawn Fawn blog for more projects with these products. I love how you used the scripty words as a background! So pretty! Definitely love how you layered the scripty falalalala word. I really like the tone on tone idea! I like how the falalalala looks like it's embossed. Such a perfect double whammy!!! BOTH sets die cut and layered!! So inspiring!! !